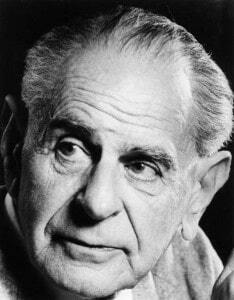 September 17th 2014 marks the 20th anniversary of Karl Popper’s death. Popper was indeed one of the most important philosophers of the past century, if not the most important of them all. But his popularity was rather unique. Instead of acceptance from professional philosophers, his ideas had their most impact in scientists and politicians. Perhaps this was the greatest honor he could have had, since methodology of science and political philosophy were the key areas of his thought. However, Popper deeply resented not having the peer recognition he thought he deserved. This lack of recognition within academic philosophy sharply contrasts with Popper’s reputation in the realm of science. The list of scientists who openly declared their admiration and gratitude for his contributions includes –among others– four Nobel Prize laureates: Peter Medawar, John Eccless, Max Perutz and Peter Mitchell. No wonder then, that the prestigious scientific journal Nature noted, “what distinguishes Popper from a great dull army of philosophers of science is that reading him is good for us”. Nevertheless, two decades is a long time. Could it be that, after his death, Popper’s philosophy is simply fading away? Some say that his most important ideas are today generally accepted. A case in point might be Popper’s open society. With the collapse of the twin demons Popper fought, Nazism and Communism, and widespread democracy across the Western world, what can Popper teach us? It may be that his own victory has defeated him. Or could it be that the acceptance of his ideas is not even close to complete? Far from irrelevant, perhaps Popper is today more needed than ever. Maybe that is why, with Nassim Nicholas Taleb, we should ask, “Where is Popper when you need him?” In the following lines I would like to present you some of Popper’s most important ideas in a somewhat unconventional manner. I will do so linking them to some important current events. As mentioned, one of Popper’s most influential book is The open society and its enemies. Published in 1945, he even considered it his own contribution to the effort of World War II. Popper believed that in Ancient Greece we could find the first traces of Western open societies. Their main feature is that nomos (legal order) is no longer part of the physis (natural order). Thus, in an open society social issues can be discussed. Moreover, each individual cannot rely on the clan, but has to be responsible for themselves. The open society makes possible something extraordinary –it unleashes the critical powers of man. Let’s now leave the fifth century b.C. and visit the much closer year of 2010. In the US, a very advanced democracy, an important health care law is on the making. And then Speaker Nancy Pelosi says in public that “we have to pass the law so you can find out what’s in it”. This quote exemplifies very well how parliamentary debate can degenerate into an acritical rush. Unlike many members of Congress, Popper believed that what distinguished human beings from animals was our ability for critical discussion. Therefore, in the political arena, we are able to debate and criticize public policy proposals before they are adopted. Through this process we can discard the damaging ones before they hurt us. In the end, this rational method of critical discussion makes our hypothesis, to cite Popper, “die in our stead”. What is more, Popper believed in reformism, but he had a gradualist approach. He thought that politicians should always be aware that their knowledge is finite. Therefore, reforms should be always very limited in their scope, and they should always state in advance what results they will achieve. The impact of the reform should be zealously measured and contrasted with the expected results. In the book Darwin’s legacy, philosopher John Dupré makes an interesting remark: “I… do maintain that science can accumulate enough evidence for its claims to make them almost  impossible to reject, and I believe that certain broad evolutionary theses have earned this level of credibility”. Due to the ‘almost’, this is a somewhat watered down version of good old epistemological justificationism. In fact, we are still used to believing that science provides us with true and justified knowledge. This means that accepted scientific theories are not only true, but we have also a method to show that they are true. And we are still used to believing that this epistemological guarantee is induction. In fact, in its stronger version, induction is both method and justification. It is the method because science supposedly operates inductively –via unbiased observation of nature in order to infer certain regularities. And it is scientific justification because these observations give empirical support to our proven theories. In his 1934 Logic of scientific discovery Popper developed a revolutionary alternative for the methodology and philosophy of sciences. Induction, according to Popper, played no role in science. Scientists start with problems which they want to solve. Observation, thus, happens always from a certain point of view. In the first class of the semester, Popper asked his students at the London School of Economics to “make observations and take notes”. His students were confused since they did not know what to observe. Popper used this to exemplify his idea that observation is always guided by an underlying theory. Moreover, induction said Popper, can never prove our theories. How many positive cases can definitely prove a scientific universal law? How many white swans can prove to us that all swans are white? Under the false belief that science could not be empirical unless it is inductive, many have neglected the logical problem of induction or even fallen into irrationalism. Popper’s solution to this problem is that science can still be rational and empirical as long as it is critical. Experimentation can play an important role in science, but it is no longer a positive one. Empirical tests can help us to discard false theories. Thus, we test our theories against reality not to prove them, but to be able to refute the ones that are wrong. Popper said that the scientific method was the method of conjectures and refutations. Scientists propose bold theories and then try to test them with the most rigorous experiments. The richest theories are the ones with predictions that rule out the most possible states of the world. In this way, they face a bigger challenge of being falsified. The rational attitude, for Popper, is to go look for the black swan. Our knowledge grows not when we find positive cases for our existing theories but when we find negative cases that contradict them. What makes science empirical is falsification. What makes our knowledge grow is that when theories are falsified, we have to replace them with new theories that have more empirical content. This means that the new theories have to explain all that the older theory did plus the anomalies that the falsified theory could not explain. Popper thought that this process of conjectures and refutations got us closer to the truth, but was itself never ending. Upon closer inspection, Dupré’s quotation sounded very reasonable. However, its implications –from a Popperian point of view– are dramatic. Ultimately, it is not rational to maintain that our theories, however fruitful they have been, can be justified… or “almost” justified. This constitutes a leap of faith –not good science. Furthermore, Popper even said that the moment a scientist thinks that her theory is justified and criticism and tests are no longer needed, she leaves the game of science. Former vice president Al Gore, US president Barack Obama and US Secretary of State John Kerry –among many others– often referred to a survey that asserts that 97% of world’s scientists believe in man-made climate change. This assertion is questionable and is currently under severe scrutiny. But more importantly, even if it were true that a vast majority of scientist agree on any given subject, would this consensus be a valid knowledge claim? Popper believed that one of the most extraordinary features of Western civilization was that it gave birth to the critical tradition. He liked to think that the pre Socratic Greek philosopher Thales said to his pupils: “This is how I see things — how I believe that things are. Try to improve upon my teaching”. This claim was based on the fact that generation after generation the members of the Ionian school criticized their masters and proposed alternative explanations. Popper’s philosophy is against authorities –epistemological and political. This includes the authority of “Science” and of scientists. Popper was in favor of a science without capital letters –a humble human project that pursues the growth of knowledge. Since we do not possess any method to prove we are right we cannot rely on any certainty. Certainties for Popper are nothing more than a product of self-suggestion. He identified reason with criticism. We are rational when we exercise our critical powers. Science –and knowledge in general– is not about creating unquestionable orthodoxies but about fallibilism and criticism. Our knowledge is conjectural. It is always opened to critical revision and refutation. Therefore, no scientific statement should be put in the category of epistemological “dogma”. Popper proposed a philosophy named critical rationalism. Perhaps this philosophy is best described as an attitude. A critical rationalist does not leave any statement out of the reach of criticism. We can exercise our critical powers in every aspect of the human life. We must always try not to defend our views but to challenge them and replace them with better ones. Consequently, Popper’s ideas are not reducible to the methodology of science. Falsificationism in science is a methodological decision that follows the broader horizon of fallibilsm. And this means that we can no longer be certain. But far from being an epistemological catastrophe, this situation can be interpreted as a blessing for, as Steve Fuller says, “we can always do better”. There are no definitive stances in our knowledge. My friend Mark Notturno worked with Popper in the last years of his of his life. Popper told him that his philosophy could be summed up with these words: “I may be wrong and you may be right, and by an effort, we may get nearer to the truth”. Above we have reviewed some questionable instances of the political process, the epistemic status of theories and the social perception of science. Many other things could be added to our list, from political correctness as source of new taboos, to the growth of fanaticism right in heart of Europe. In the light of these problems and misconceptions, a rational, dialogical, nonconformist and antiauthoritarian approach like Popper’s seems worthy of being revisited.